Duckbilled dinosaur coming back to N. D.
This photo provided by the National Geographic Society shows the scale of the fossilized skin of a duckbilled hadrosaur found in 1999 in North Dakota. Soft parts of dead animals normally decompose rapidly after death. 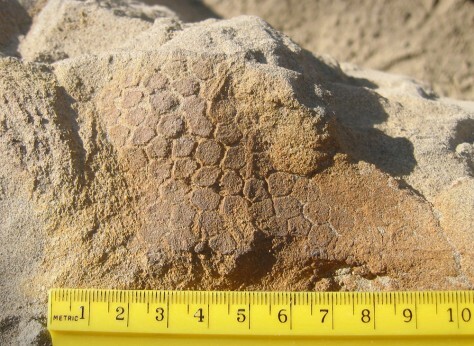 Because of chemical conditions where this animal died, fossilization took place faster than the decomposition, leaving mineralized portions of the tissue.